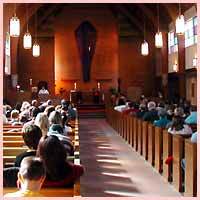 Our Redeemer Lutheran Church, located just south of Sunrise Highway on Washington Avenue in Seaford, Long Island, New York, is a family of believers dedicated to proclaiming Christ's message of love to people of all ages, in all aspects of life. First established in 1931, our focus on the risen Lord's presence in family, community, and the daily events that shape our lives, continues to provide comfort, direction, support and joy in this rapidly changing world. Visit us and become a part of our family as we experience worship, work and fellowship together in Jesus's name! Join the Our Redeemer Family !